A good understanding of Anatomy and Physiology (the study of the structure and function of the 12 systems of the body) underpins all that a good therapist does. The more you understand about the body the more you can tailor your treatment to meet the needs of the client. This understanding will enhance your enjoyment of your therapy and crucially ensure you are working safely. 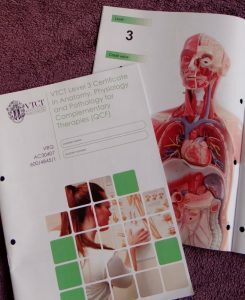 The VTCT Level 3 Certificate in Anatomy, Physiology and Pathology for Complementary Therapies (QCF) is a knowledge-based qualification which will provide you with a sound foundation to pursue a career as a complementary therapist. This qualification will develop your knowledge and understanding of the organisation of the body, and the structure, function and pathologies of the skin, hair and nails (did you know that as a group these are known as the Integumentary system?). You will also learn about the structure, function and pathologies of the human body systems including the skeletal, muscular, nervous, endocrine, lymphatic, respiratory, cardiovascular, digestive, urinary and reproductive system. The training takes place over 10 days; 1 day per week, usually coinciding with school term times, although this is flexible and agreed on booking. You will also be required to undertake some guided home study outside these hours. To complete the qualification you are required to sit 2 external exam papers set by VTCT. You are not required to purchase any other study materials although some learners may benefit from and enjoy using a range of books. This will be discussed with your tutor and recommendations provided. The final exam includes two papers, two hours each with 90 questions. It is a multiple choice exam (including labelling diagrams) and the pass mark is 70%. £595 (inc. VAT) which includes a VTCT registration fee, course materials and multiple choice exam paper. Refresher courses are also available if your previous Anatomy and Physiology qualification has lapsed. This can be agreed on a 1:1 basis with personal tuition provided to update your qualification. Please contact us for details and prices. The next course will be starting on Thursday 25 April 2019. Places are limited so please do contact us early if you are interested Other dates may soon be available, please ring to discuss your requirements. This qualification is called a “Certificate”. Since 1st September 2012 it is no longer possible to achieve an accredited “Diploma” in Anatomy, Physiology and Pathology from any Government-approved Awarding Organisation. This QCF Level 3 Certificate is now the recognised qualification and the industry norm. Error: Error validating access token: Session has expired on Monday, 15-Apr-19 01:34:43 PDT. The current time is Tuesday, 23-Apr-19 19:10:18 PDT.